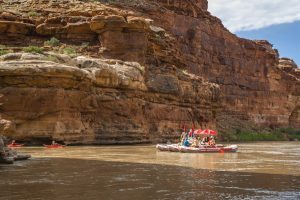 Green River, Utah – March 28, 2012 – Holiday River Expeditions is pleased to announce that it is celebrating National Parks Week by offering great savings on several of their rafting, mountain biking and combination rafting and biking trips. These trips will take place in two of America’s most beautiful national parks, Canyonlands National Park and Dinosaur National Park. Adventure seekers can now book trips on select Cataract Canyon Rafting or Combo Cataract Rafting & White Rim Trail Mt Biking trips and take $200 off the adult fare. For biking enthusiasts, the ultimate mountain biking adventure, the White Rim Trail Mt Biking trip is available at $100 off the regular adult rate. 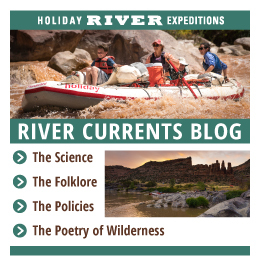 Holiday River Expeditions is also offering select Yampa River or Combo Yampa Bike & Raft trips at an incredible savings of $200 off the Adult Fare. On the Colorado River, the Green River, and other rivers located in Utah, Idaho and Colorado. This allows visitors to choose a trip, location, and time frame that will work with almost any schedule or skill level. As a well-known supporter of environmental causes, Holiday River Expeditions respects the land, the water and wildlife and is excited to be able to offer these exclusive prices on these trips. Whitewater rafting and biking trips give visitors ultimate access to the gorgeous hidden treasures of America’s legendary wilderness park locations. The National Parks Week Special runs from April17-27but the trips will take place this summer during the months of May, June, July and August. National Parks Week runs from April 21 through April 29 this year and features FREE admission to all national parks found in the U.S. America’s national parks have something for everyone no matter how old or how young. Enjoy the wilderness experience while you capture on film wild elk, deer, eagles and bears in their natural habitat.